So mini cheesecakes are the perfect sweet treat to end a meal or a as little pick me-up at afternoon tea time. The recipe is my go-to recipe for baked cheesecake, blogged here many times. I substituted mascarpone for cream cheese, for no other reason than I had some in the fridge and thought it would go well in cheesecake! I added crystallized ginger to my little cheesecakes as well as ginger caramel, but plain caramel would be fine too. To serve, I put some chunks of fresh pineapple on the top of each little cheesecake. This complemented the ginger flavour beautifully! Preheat the oven to 180 degrees C or 170 degrees fan-forced. Butter individual molds with a removable base, see photo. If you don’t have these molds, you could use ordinary muffin or cupcake molds. You would just need to be careful easing them out of the molds. I filled 8 of my removable bottom molds. You would fill at least 8 or even 10 ordinary muffin molds. Crush biscuits very finely in a food processor and add the nutmeg and cinnamon. Melt butter in a saucepan, remove from heat and quickly stir in the biscuit crumbs. Press firmly into greased molds, covering the bases with a good layer of biscuit crumb. Put mascarpone, sugar and caramel in the food processor and mix well. Add eggs one at a time, whizzing after each addition. Stir in the crystallized ginger pieces. Pour mixture into the individual molds on top of the biscuit crumb bases. Fill each mold to about 3/4 full. Place in the oven and bake for about 20-25 minutes until the cheesecake is just set. Remove from oven and leave to cool completely. Carefully remove each cheesecake from its mold. Store in refrigerator for at least 6 hours or overnight to completely firm up. Serve cold, with chunks of pineapple on top of each cheesecake, and extra slivers of crystallized ginger. You could drizzle a little warmed caramel over the top too, for a truly caramel experience! 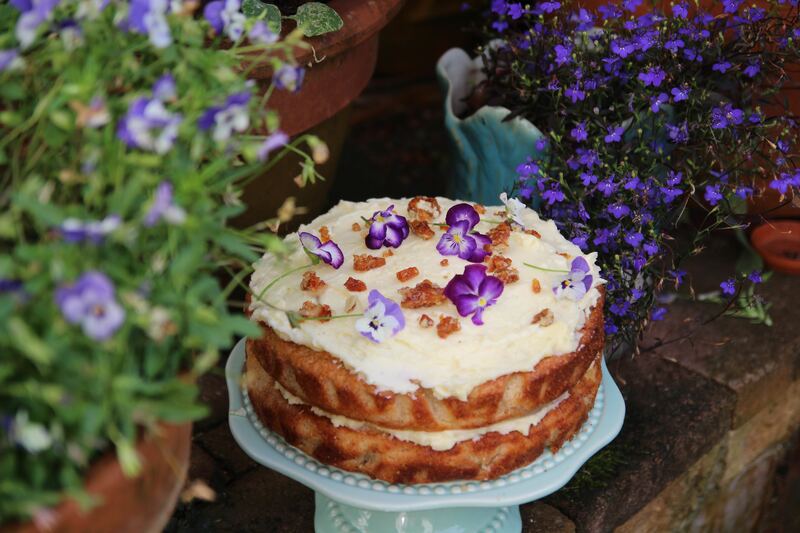 Posted in Cakes, Dessert, Pies, Tarts and Quiches, Small Baked Things, Sweet Food and tagged afternoon tea, caramel, ginger, mascarpone, pineapple. Bookmark the permalink. For Christmas lunch 2014 I couldn’t decide between a traditional Christmas pudding and the Jamie Oliver Christmas bombe, see here for his recipe. I made the latter a couple of years ago and Quirky Sister the Elder made a special request for its return this year. 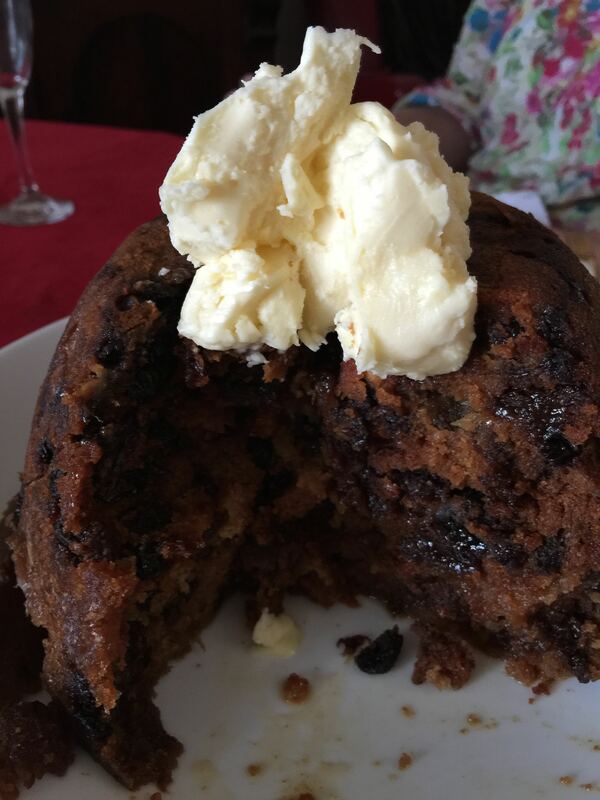 As one Christmas pudding is never enough, I made both! The hot pudding is a tropical take on the classic as it’s filled with pineapple and rum… yum. The Christmas bombe is pudding shaped and filled with panettone, ice cream and glacé fruit and alcohol, finished with a dark chocolate glaze. Both are delicious! I found this recipe in a little book of pudding recipes published by the Women’s Weekly, which I have had for many years. 450g can of pineapple (crushed or pieces) in syrup – crushed gives a smoother texture, pieces gives you chunks of pineapple. Grease a 2 litre pudding bowl. Drain pineapple well, reserve 125ml of pineapple syrup. Place pineapple on absorbent paper, pat dry. Combine butter and sugar in large pan; stir over medium heat without boiling, until sugar is dissolved. To make Rum Syrup, add sugar to small saucepan, heat gently, stirring until sugar is dissolved and browned. Carefully add rum and reserved pineapple syrup. Mixture will bubble. Continue stirring until the toffee like mixture dissolves. Stir in half the Rum Syrup to butter and sugar mixture and bring to the boil, then remove from heat. Stir in all the fruit and pineapple; cool to room temperature. The rest of the Rum Syrup can be used to make a sauce for the pudding or added to cakes or muffins as a flavouring. Place the fruit mixture in a large bowl. Stir in eggs, sifted flours and breadcrumbs. Spoon pudding mixture into greased pudding bowl. Top with foil-lined baking paper or if you don’t have this, use baking paper plus foil. Make sure you cut a piece large enough to allow the pudding to expand when cooked – you can make a pleat in the paper which will allow this expansion. Secure with string round the top of the pudding bowl. You can make an easy handling device by simply folding a piece of foil lengthways with 4 thicknesses and placing this under the bowl in the pot rather like a handle. Place pudding bowl in a large pot with boiling water to come halfway up the side of the bowl. Cover with a tight fitting lid; boil for 6 hours. Replenish with hot water from a kettle as needed. When cool enough to handle, take pudding bowl out of the pot and the pudding out of the bowl. Wrap in cling wrap and store in a cool place – in summer in the fridge. To reheat, remove the cling wrap and return the pudding to its bowl and the bowl to the pot filled with water as before. Steam for 1/2 – 1 hour as above to gently reheat. Carefully remove the bowl from the pot and turn out the hot pudding on to a plate. Serve at the table flamed with brandy or whisky and with hard sauce or brandy butter. Take the ice cream out of the freezer so it can soften a little. Line a 2 litre pudding bowl with 3 layers of cling film. Using a serrated knife, cut four 2cm thick rounds off of the panettone then cut them in half. You’ll have some panettone left over, so keep this for another time. Arrange six of the slices in a single layer around the bowl and push them down if they overlap. Drizzle some of the alcohol around the panettone slices so it soaks in, then use the back of a spoon to smear the jam over the panettone. Add 1/2 the ice cream to the bowl and spread it around in a thick layer. Spoon in the cherries and glacé fruit, gently pushing them into the ice cream – some pieces will be submerged and some will sit on the top. Add the rest of the ice cream. Spread it out, working quickly so the ice cream doesn’t completely melt. Put the rest of the panettone slices on top of the ice cream, drizzle over some more alcohol then cover the bowl tightly with the cling film that is overhanging the bowl. Cover with a final layer of cling film. Press a plate down on top to press everything down, then freeze overnight, or longer. 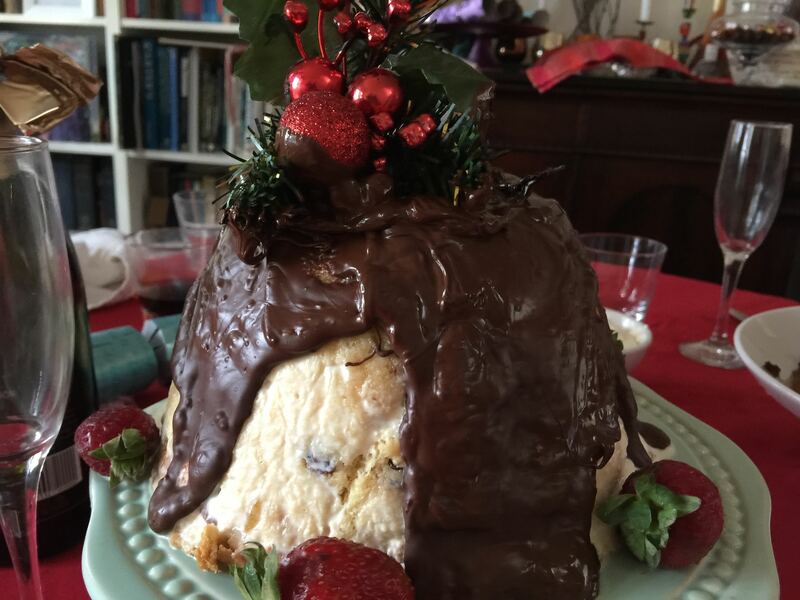 Take out of the freezer, unwrap the bombe and put in the fridge for 1/2 – 1 hour before serving. Put the bashed-up chocolate in a bowl and melt gently over a pan of simmering water on a low heat. Add some grated orange or mandarin zest to the chocolate. Place the bombe on a serving platter or plate. When the chocolate is melted, pour it over the top of the bombe and serve immediately while the chocolate is still warm. 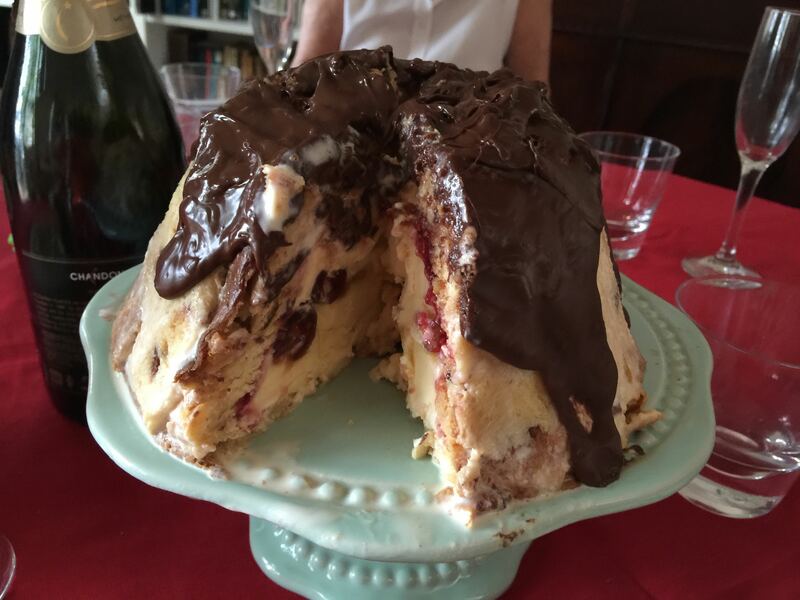 Posted in Dessert, Jamie Oliver, Sweet Food and tagged brandy butter, cherries, Christmas pudding, glace fruit, hard sauce, ice cream bombe, Jamie Oliver, Pedro Ximinez, pineapple, rum, winter bombe. Bookmark the permalink. I found this recipe in a fabulous cook book of mine, the Silver Palate Cookbook. 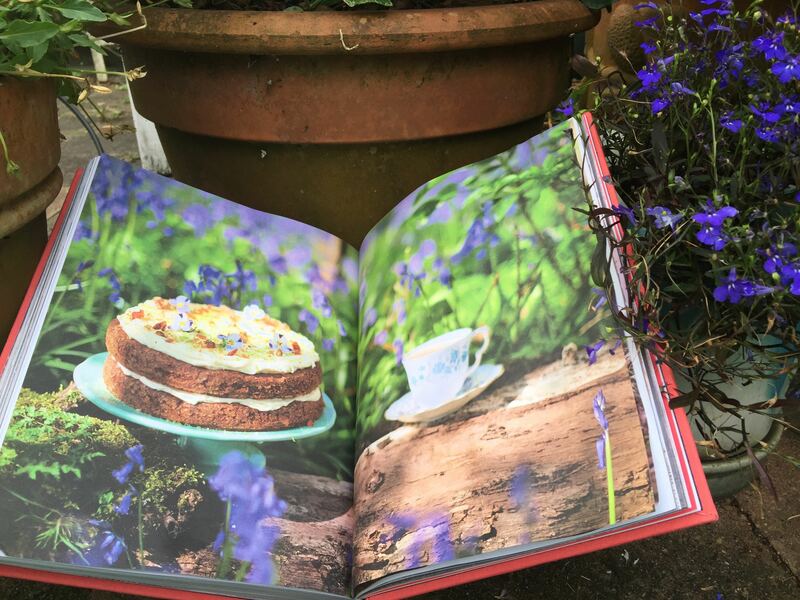 This book, plus the follow up The Silver Palate Good Times Cookbook, are treasure troves of stunning recipes; some hearty, some fancy, some healthy, some decadent! 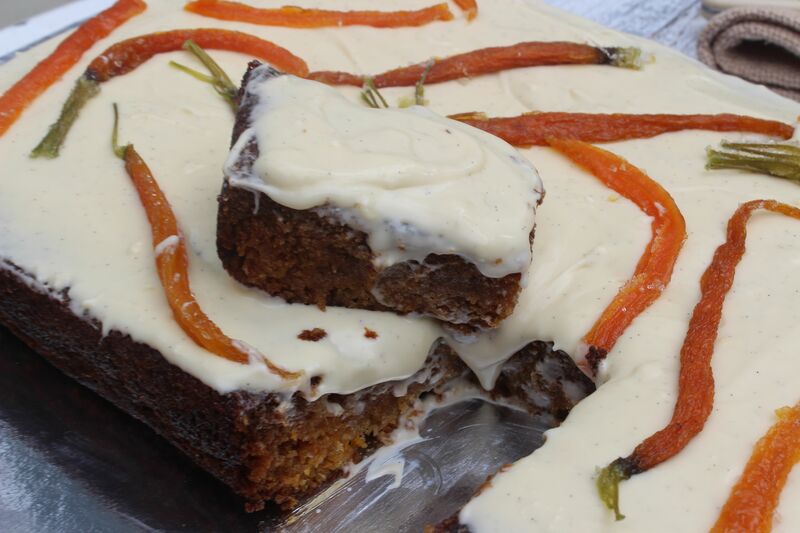 The carrot cake recipe is unusual is that it contains cooked carrots. 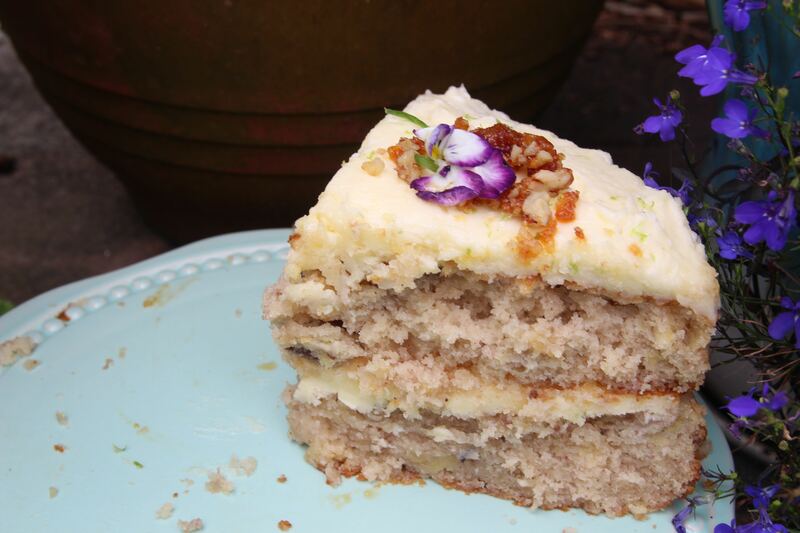 These give the cake a deep, slightly caramelized, flavour. I have added ground ginger as well as cinnamon, as ginger works well with carrot. 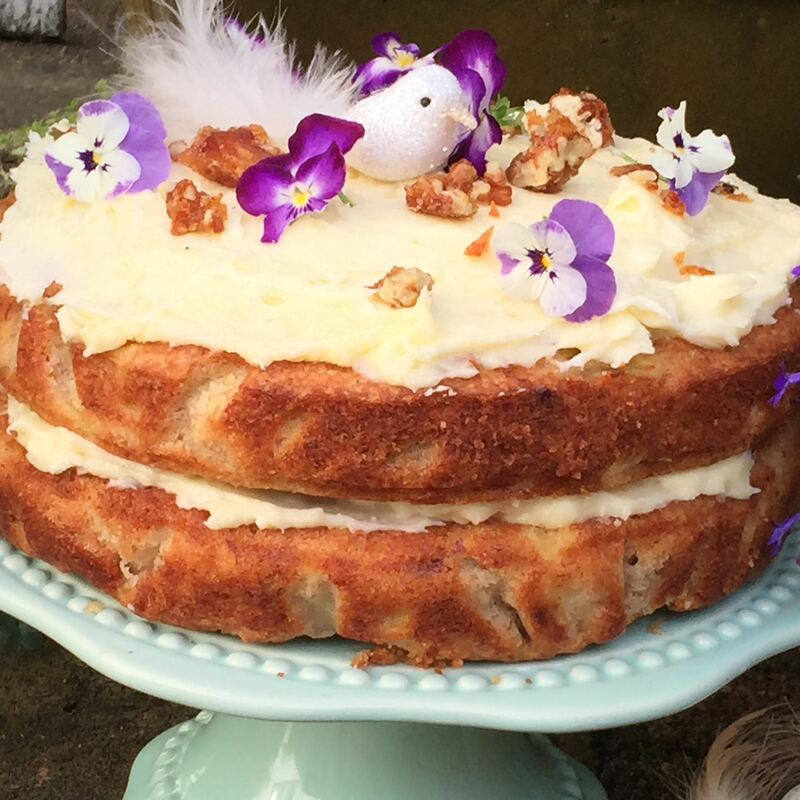 You can omit the walnuts, as I did in the pictured cake, for your nut free friends. The candied baby carrots were my addition, and they looked really pretty and tasted great! Preheat oven to 170 degrees C. Grease two 23 cm springform tins. Sift the dry ingredients into a bowl. Add the oil, eggs and vanilla. Beat well. Fold in the walnuts, coconut, carrots and pineapple. Pour the batter into the prepared tins. Place on the centre rack of the oven and bake until the edges have pulled away from the sides and a skewer inserted in the centre comes out clean, about 50 minutes. Cool on a cake rack for 3 hours. Fill and frost the cake with the cream cheese frosting. Cream together cream cheese and butter in a mixing bowl. Slowly sift in the icing sugar and continue beating until fully incorporated. Mixture should be free of lumps. Stir in vanilla, and lemon juice if desired. Decorate with candied carrots and sifted icing sugar. Take 6 baby carrots, trim, leaving some green tops. Keep smaller carrots whole and slice larger carrots in halves or quarters through the length of carrot. In a small saucepan, combine 2 cups of sugar and 1 cup of water. Place over high heat, and bring to a boil, brushing the sides of the saucepan with cold water to prevent the sugar from crystallizing. Add carrots, and reduce the heat to medium. Cook until carrots are translucent, about 25 minutes. In another small saucepan, combine 1.5 cups of sugar with .5 cup water. Place over high heat, and bring to a boil, brushing the sides of the saucepan with cold water to prevent the sugar from crystallizing. When the sugar has completely dissolved, remove from heat. Use a slotted spoon to transfer candied carrots from the syrup in which they boiled to this new sugar syrup. Let stand until completely cooled; discard the old syrup. Transfer carrots to some baking paper, gently pat dry with kitchen towel. 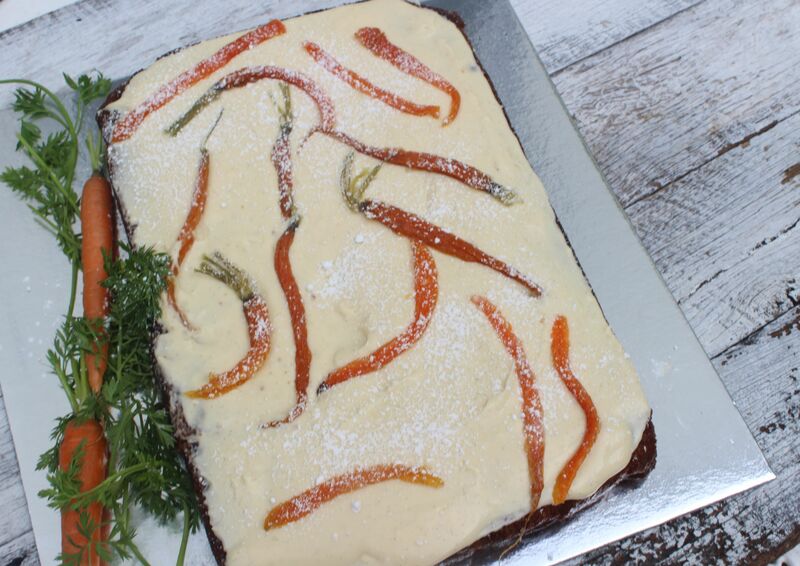 The carrots can be used to decorate the cake or stored for a couple of days in an airtight container. 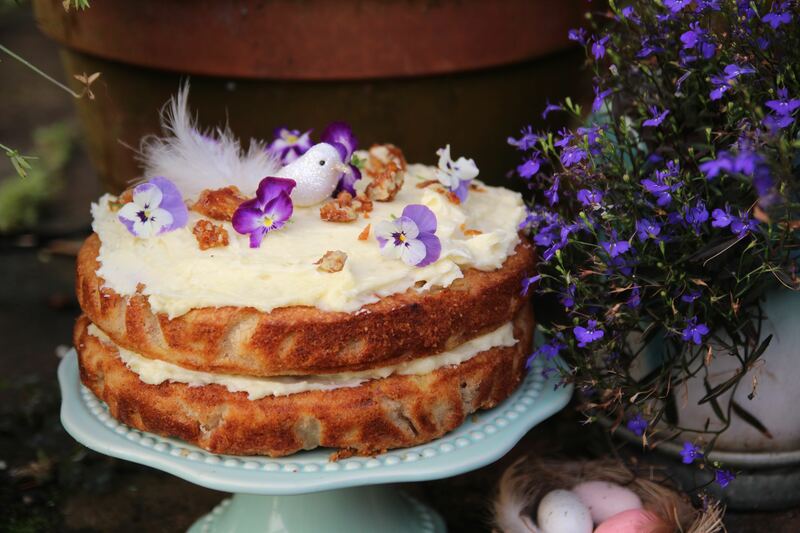 Posted in Cakes, Dessert, Sweet Food and tagged afternoon tea, carrots, cinnamon, coconut, cream cheese, dessert, ginger, pineapple, vegetable cake, walnuts. Bookmark the permalink.